Arthur Richards Junior High School in St. Croix school has been vacant since Hurricane Maria hit. The scars and bruises are still visible a year later. 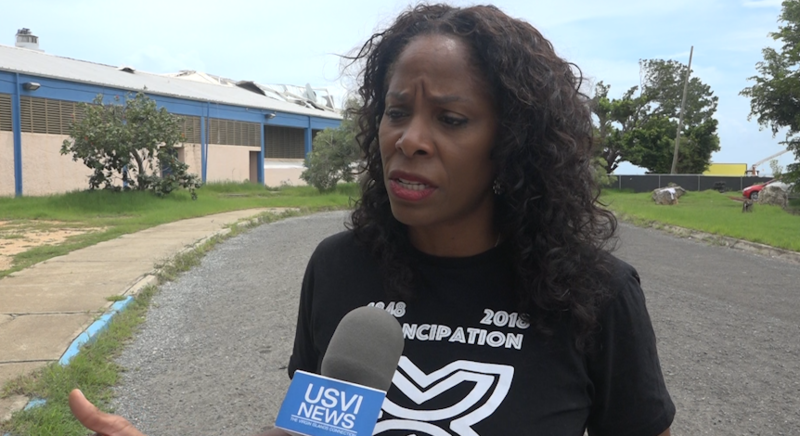 “I think in the long term we’ll be fine, but I am concerned about what’s happening to our children mentally, psy chologically, the teachers as well with these fits and starts that we’ve bene having,” Congresswoman Stacey Plaskett (D-USVI-At Large) said. While dealing with the recovery from the halls of Congress, the thing Plaskett has been the most vocal about is the students. She recently hosted a forum in Washington D.C. to draw attention to the recovery efforts in our schools. That struggle was dealing with weeks long, even month delays for some schools in the Virgin Islands. As we covered the opening of some schools on CBS USVI News, parents were relieved just to get the kids back to school. But Plaskett said now that they’re back, it isn’t stopping her from asking other government officials and federal agencies, why there were such long delays and what they could have done differently. “Why did it take so long for equipment to be down here, for approval to be given so that funding could be drawn down to get the contractors in place, etc. Where are those discrepancies so that we can correct it,” she added. In response to this story, Commissioner of Education Sharon McCollum stated that most of the school campuses were still active construction sites and in the interest of everyone’s (students, teachers and staff) safety, the district and state leadership saw it best to keep students away from the campus so construction crews can work day in and day out to fully prepare the grounds and facilities for students and teachers.